The Electrovert® OmniMax™ series reflow soldering system is designed to deliver maximum thermal performance combined with process capability and control. The OmniMax platform offers a combination of industry-proven technologies in an easy to use, reliable and efficient mass reflow system for high-end production requirements. From lead-free to hybrid processing, the OmniMax 7-zone oven delivers superb yields. The OmniMax sets the standard in innovative technologies that save on the lowest power and nitrogen consumption rates. The patented IsoThermal™ chamber technology is what differentiates Electrovert ovens from others. In a reflow oven, the consistent thermal capability and control within the heated length is what matters most rather than the number of zones. OmniMax 7 uses a dual IsoThermal approach that produces ΔT’s less than ±2°C. On thermally-challenging heavily populated PCBs, OmniMax outperformed competitive 7, 8, and 9 zone ovens in thermal capability and uniformity, and energy consumption. he OmniMax and OmniES incorporate the patented IsoThermal™ Chamber Technology (ICT). This is an advanced, efficient heating chamber design that provides maximum thermal performance. Electrovert’s innovative approach to thermal transfer delivers highly efficient heat transfer throughout the entire process and product. Consistent thermal performance of the ICT promotes excellent zone separation, minimizes cross board ΔT’s and allows for better control of time above liquidus. The patented cooling module in OmniMax/ES series is designed to provide process flexibility, to meet the cooling slope requirements of thermally-challenging board assemblies, and to reduce the opportunity for flux dripping in the process area. The air flow dynamics within the cooling zones are efficiently controlled for a balanced environment that can reduce nitrogen consumption up to 20-25%. The design includes a patented dripless cooling module that significantly reduces the potential for flux dripping in the cooling area. Excellent separation between the heating and cooling areas produces a tight control of time-above-liquidus. Full and easy accessibility to all major assemblies. Dual Track conveyor (with/without center board support) is optional for additional throughput capability. At the end of the final assembly process, each OmniMax and OmniES system undergoes vigorous tests that are designed to ensure each system is lead-free validated and optimized. Each system has multiple thermal profiles that are recorded utilizing a calibrated test vehicle. The test vehicle simulates actual component temperatures and precisely verifies cross-board uniformity. Cpk data is collected to verify machine performance and repeatability. If the system is ordered with a nitrogen inerted chamber, dynamic testing is performed to ensure that the chamber inerts to a low ppm atmosphere (tests are conducted in a simulated production environment). The Electrovert promise is that each OmniMax/ES system is lead-free validated and optimized. In addition, the quality assurance data and reports are included in the machine documentation package that is provided with each oven. The software and controls of the OmniMax/ES were designed to be user-friendly. The Windows® operating system is multi-functional and easy to use. The 3D GUI provides the user a real-time view of the complete machine modules, operation, and product being soldered. All Electrovert systems have a customizable ‘dashboard’ quick view screen. 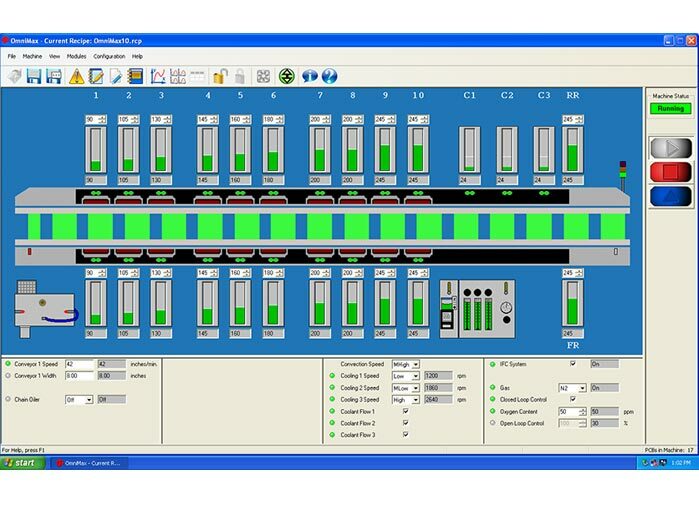 Quick view allows engineers and operators to view critical machine parameters that are important to the process or application. 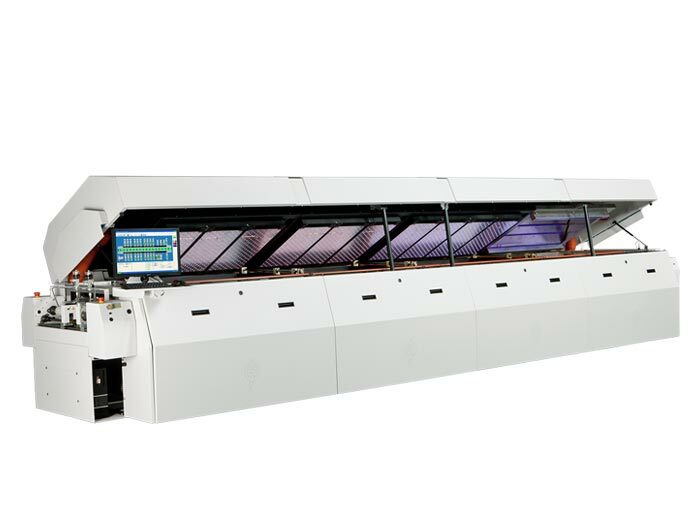 The OmniMax/ES series reflow are designed for process flexibility. All systems are available for reflow soldering in air or nitrogen. OmniMax/ES series ovens are ‘nitrogen capable and ready’. Converting from air to nitrogen is available as a field upgrade (consult with factory so that the serial # and configuration can be verified for compatibility). The air flow dynamics within the cooling chambers are outside and away from the process area for dripless cooling. Each zone of the cooling chamber has independent access capability for ease of maintenance. The patented diffuser plate eliminates the potential for liquid build-up that may drip into the process area. All design aspects of the cooling section are focused on reducing and simplifying the maintenance process. Electrovert’s closed-loop nitrogen control feature provides an automatic approach to maintaining and controlling PPM levels within the reflow zones. Closed-loop nitrogen control has the potential to significantly reduce nitrogen consumption, especially in high-mix low-volume production environments. Intelligent flux control is a patented multi-stage flux collection system that significantly reduces maintenance in the process area. Integrated features including self-clean, alarm-based notifications, and a multi-unit design provide effective and efficient flux collection. The collection system is easy to access and enables maintenance without interrupting production. The OmniCheck process monitoring system delivers cost-effective, continuous verification of process temperatures and conveyor speed. OmniCheck offers redundancy to the OmniMax/ES standard control system and is 100% integrated into the machine software. Thermal sensors are placed in close proximity to the board assemblies for each heating and cooling zone. OmniCheck data is compatible with the machine standard data logging for product traceability and verification requirements. A full range of conveyor features offer complete product and process flexibility supporting production throughput requirements. The range of features includes mesh belt conveyor, pin chain conveyor, and pin and mesh combinations. The precision center board support is synchronized with the pin chain and includes computer-controlled width positioning. It is auto-height retractable, and includes park features. The optional SMEMA 35 mm Dual Track Dual Lane conveyor system provides increased throughput capability. 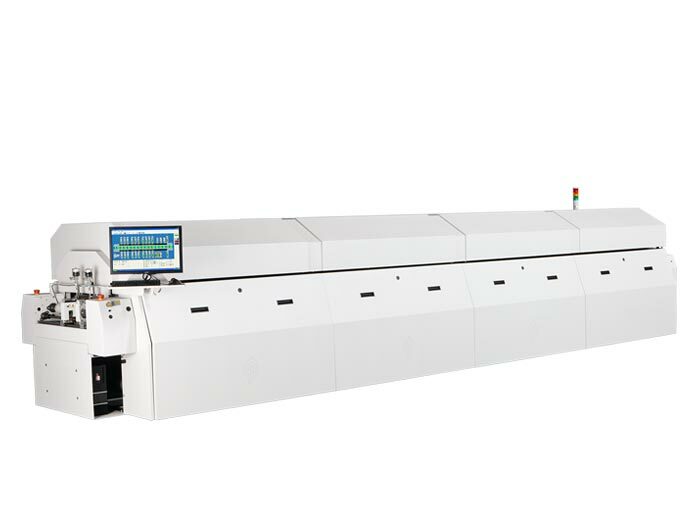 The dual lanes have independent speed control and allow complete flexibility for high-throughput applications. The barcode scanning system offers the ability to maximize productivity, process control, and traceability with an advanced set of features. The user-friendly integrated software includes special features including automated recipe changeover, barcode association, barcode message formatting, and data collection. The barcode scanning feature is available for single and dual lane conveyors, and is also field-upgradable. In today’s business environment it is important to partner with suppliers who are willing to work on special applications and are committed to providing process solutions. Contact Electrovert if you have a special product or application and are interested in finding a specialized solution.